Similar to that series, Brian K. Vaughan has imagined a future one hundred years and change from now, but his speculations aren’t nearly as realistic. Imagine a future where not only has Canada NOT been assumed into the United States, they’re also a multicultural utopia. Oh, wait, that’s what Canada is supposed to be today, right? What if I told you it’s also full of brave men and women ready to stand up and take arms – you know, if they had to – against American Imperialism, after we’ve invaded them for their water? This book is such a perfect illustration of uniquely Canadian delusions it should be taught in Canadian Studies classes a hundred years from now. This happens mere seconds before Ottawa 2112 is bombed by the US, mere minutes after the White House is attacked. It’s either ludicrously lazy writing, or, more likely, setup for some end-of-the-first-trade reveal about the attack being faked as a pretext of military invasion – you know, like 9/11. Given that the villains of Vaughan’s incredibly overrated Saga are thinly veiled caricatures of Bush and the Saudis, it wouldn’t be a surprise. The dialogue about Superman is a little more layered. This one smug Anglican defends his ’S’ tattoo as a mark of Canadian pride because although the city of Cleveland is, like Vaughan himself, “just where the writer was from,” the guy “who did all the real work” was “born and raised in Toronto” and that’s “actually what the entire comic is about!” So not only do you have Vaughan disparaging his own half of the craft AND Cleveland just to let this twerp make his flimsy stretch of a point, he goes on to say that America is like Metropolis – “this huge wonderland that’s mostly run by greedy bastards like Lex Luthor” while Canada is “like the planet Krypton, this peaceful place that sends our most amazing people out into the universe.” Desperate bluster like this reminds of the times I’ve been told by Canadians that guys like Jim Carrey were “stolen” by the US; any rationalization is preferable to the idea that someone born there might have good reason not to stay. Oh and by the way, Joe Shuster left Toronto around age 10 and moved to – yeah, you got it – Cleveland, where he later met Jerry Siegel in high school. No doubt the subtext of Canadian values and virtue was a frequent discussion between them during the creation of Kal-El. Post-Trudeau Canadian pride isn’t a real belief; it’s the post-colonial self-hatred of an incredibly lucky colonial inheritance with nothing to replace it but jealous contempt for the older brother who moved out of their parents’ house instead of waiting for them to die of old age. The surest defense against existential uncertainty is to define oneself in opposition to others. 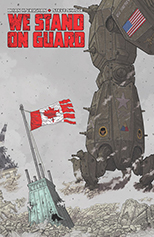 We Stand On Guard will no doubt be an unwittingly thorough treatise on how Canadians can only define themselves in comparison to the big, mean USA, replete with Vaughan’s TV sitcom beats and Joss Whedon quality characterizations. Steve Skroce’s art is really good. Awesome mechs. Matt Hollingsworth’s colors are almost as boring as Canada so good job there too, eh? Writer, Brian K. Vaughan; artist, Steve Skroce; colorist, Matt Hollingsworth; letterer, Fonografiks; Coordinator, Eric Stephenson; publisher, Image Comics. Incredible. I guess in my life I’ve already read far too many nationalistic, jingo driven comics that this one went way over my head and I didn’t really notice it. As far as comics go, this to me was a decently paced, by the numbers intro to an adventure series. Not much original, but professionally well enough produced to be a nice demonstration of what the the big two are totally incapable of these days. This was one of those recent rarities where it might of sold BETTER coming from DC or Marvel, as that’s their main audience.